With expansive views of the glittering Melbourne CBD skyline and a diversity of apartment options for varying life stages, Mirvac’s Yarra Point tower has been named Victoria’s best apartment complex at the 2014 HIA CSR Victorian Housing awards. 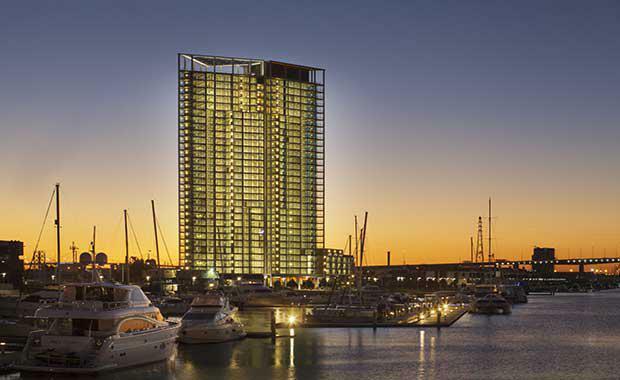 Yarra Point is Mirvac’s sixth apartment tower at its Yarra’s Edge precinct in Melbourne’s Docklands, and features 201 apartments over 31 levels. Yarra Point’s latest accolade is Mirvac’s first win in the apartments category at the HIA CSR Housing Awards, and follows the success of Mirvac’s townhouse development Laureate at Albert Park, and luxury waterside residence development River at Yarra’s Edge, both taking out the national award for the Townhouse/Villa Development of the Year category in 2011 and 2014 respectively. Mirvac Group Executive of Residential, John Carfi, said the HIA CSR Apartment Complex award recognised the intelligence of Yarra Point’s design. “With dwellings ranging from one to three bedroom apartments, plus multi-storey terrace homes offering townhouse-style living, Yarra Point was designed to offer a range of living solutions,” he said. “Significant research went into designing the building’s north-facing aspect and ensuring each and every apartment benefited from this exposure. In addition to spacious floor plans, Yarra Point residents also enjoy exclusive access to a 300 square metre rooftop garden, residents’ lounge, gym and business centre as well as a two-level lobby featuring mature trees, a garden of succulent plantings and bluestone paving that extends from the adjacent park to the building’s inner sanctum. The building is part of the wider Yarra’s Edge precinct, where Mirvac unveiled the latest chapter of the multi-stage project earlier this year. Wharf’s Entrance will further activate the precinct with Forge, a 228 apartment tower over 30 levels; 11 luxury riverfront Wharfside Residence homes and seven Cargo home offices.